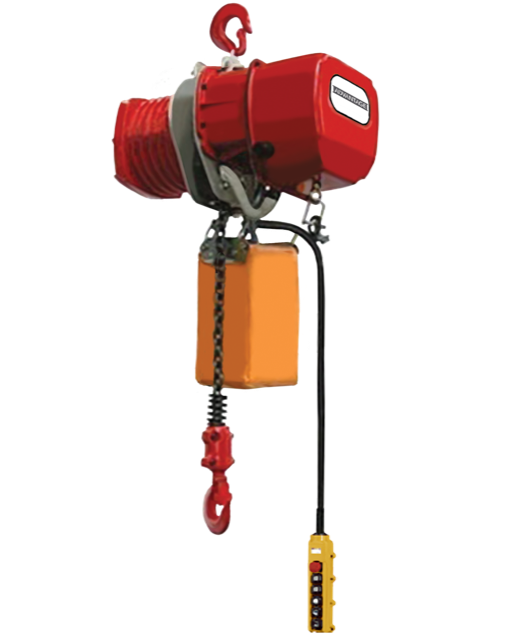 The Advantage Series electric chain hoist boasts superior quality and exceptional features. Ability to carry a one ton to five ton load and comes with a chain bag and six button pendant. All units come standard with a mechanical load brake and undergo rigorous testing to comply with our stringent Ace quality standards. Many different speeds and lifts are available, as are motorized trolleys and lug mount kits. Hoist motor features aluminum alloy cast housing for optimal motor heat dissipation and to reduce overall hoist weight. Electrical controls feature magnetic contactors with circuit breakers instead of fuses. In case of overload trip the circuit breaker can be easily reset, eliminating the need to replace fuses. Variable frequency controls are available for applications requiring more than one lifting speed. Six pushbutton pendant with emergency stop is durable, light weight, and water proof. Power to pendant control transformed to 115v to ensure safe operation in case of short circuit.